My youngest daughter is getting married in September!!! Can you tell I am excited? There are so many beautiful events surrounding the wedding that I have started calling this the summer of Love. My daughters recently hosted a Garden Party themed Bridal Shower and I thought I'd share how everything turned out. 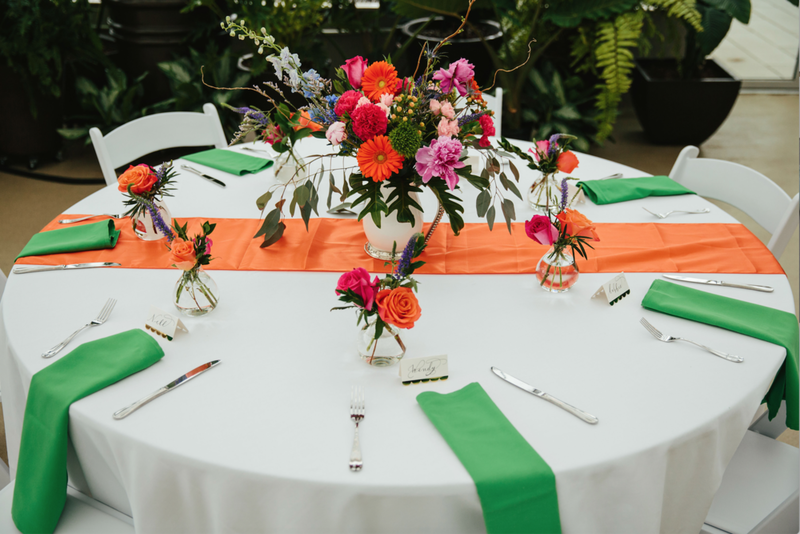 Pink, orange and green make a perfect color scheme for a garden party. My oldest daughter and step daughter hosted the Bridal Shower which took place a few weekends ago. I could not help but put myself in charge of the decor (come on, we know its just makes me happy dance). After choosing the date and the Venue (Downtown Market Greenhouse in Grand Rapids, MI) the choice of the Garden Party theme came pretty easy. The invitations from Minted (here), helped us set the tone. I knew that the greenhouse was going to need big bright pops of color to break up all the beautiful greenery. 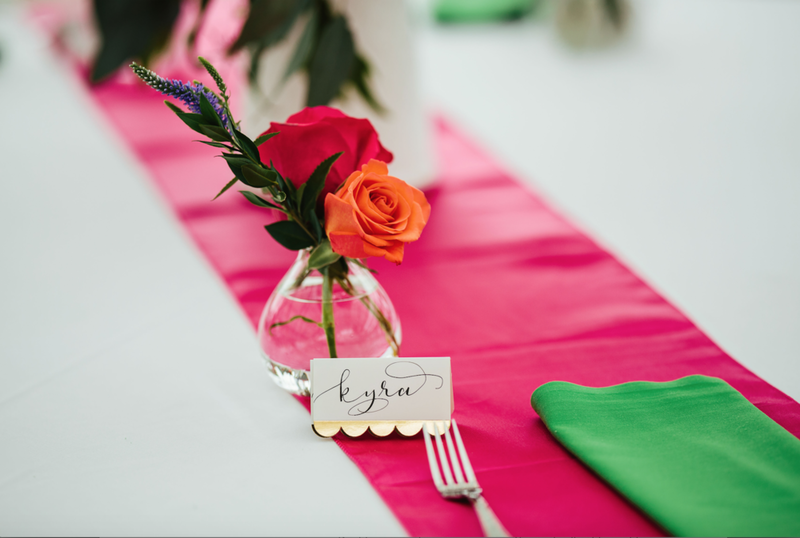 I layered the table with brightly colored runners, bright green napkins and loads and loads of gorgeous fresh flowers (peonies, gerbera daisies and roses oh my!). We added small bud vases (here) filled with pink and orange roses that were also pulled double duty as favors and placeholders. From early on I knew I wanted to make a floral crown for my daughter. She has such bohemian soul. I also knew I wanted to stay away from a "BOHO RUSTIC" look so I went for larger, brighter flowers. (I will post the tutorial next time). It took a couple of stops at local floral haunts to pick out the PERFECT flowers but in the end it was so much fun! Floral Crown holding the Brides seat. And my lovely daughter with flower crown. DIY at it's finest! The Brides favorite meal is always brunch so we chose a menu with all her favorites including Chicken and Waffles with a bourbon sauce, fresh fruit and bagels, salads and of course a Mimosa bar. I love a Bridal shower that includes special personalized touches. We had a sign designed by a local graphic designer that gave details of how the couple met and some of their favorite things. The sign greeted guests as they arrived. My oldest daughter made a very special video for my daughter and included all the guests at the shower. It was a beautiful touch (and there was not a dry eye in the house). Since it is a well know fact that my daughter is a huge fan of the selfie and her sisters know her well, they made sure there were photo props available and that each guest had an opportunity to have their photos taken with the Bride to be. It turned out to be great ice breaker while guests got settled and grabbed a beverage and found their seats. My daughter can be shy, so we had her Fiancé join her for games and present opening. I highly recommend! It turned out to be a huge bonus for those friends and family who had not met him before. We played a few games (making sure the prizes fit the theme) and then sent our guests on their with favors as a remembrance of the day. 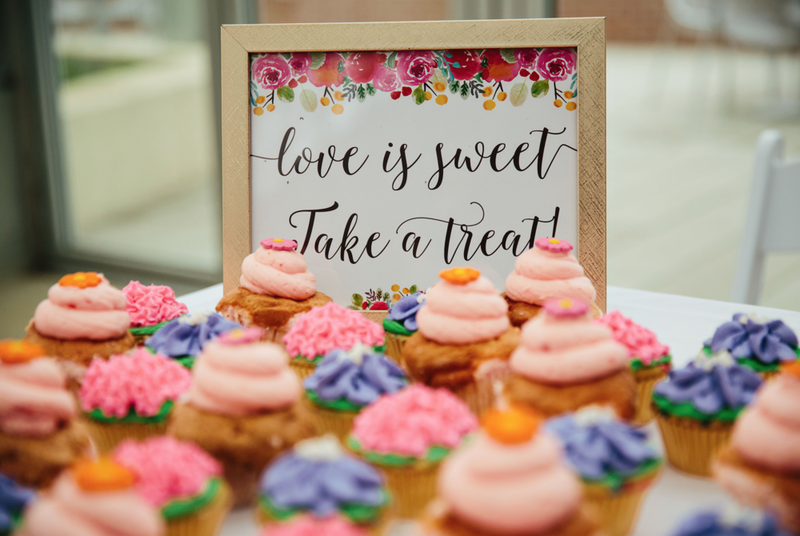 We continued the theme with cupcakes decorated with flowers and boxed in brightly colored boxes along with floral scented candles. Everyone had a wonderful time and my daughter felt very special. Now on to planning the wedding decor! Thanks for popping in today and stay tuned for that floral crown tutorial! Photo Cred goes to the ahhhmazing Holly @grauperphoto in Grand Rapids.